Learn about Spanish Artists, History, Architecture and Photography in University level classes, presentations, field trips, films, guest speakers and lunches with like minded adults. Join to Receive Reports, Invites and Updates. - Come early for your coffee. NOTE: If you enjoy ancient artifacts then you can head back to the museum after the lecture. Javea's architecture reflects three special historical periods when wealth and prosperity produced very unique sacred and civil architecture. Dionisio Fierros (1827-1894 ) was a Spanish Romantic painter who in 1849 painted a "vanitas", an allegorical still life, for the Marquis of San Adrián of Navarra. It wasn't a very robust work of art, especially in an era of great Romanticism and drama. 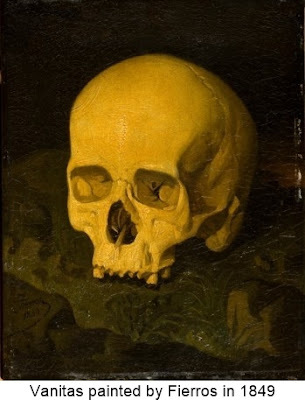 It was a traditional "vanitas" of a skull, which was the most common symbol representing the transience of life, the futility of pleasure, and the certainty of death. It was a human skull displayed in a three quarter view. It had no jaw. It rested on a green carpet. It showed many dental failures. The color used was a toasted yellow. It would have been a fairly boring 44 x 37 cm oil on canvas painting had it not been for the three words written on the back of the wooden frame, in sepia ink; ' Skull of Goya '. "INSPIRATIONAL & INSIGHTFUL TRIBUTE TO A GENIUS"
LECTURE with SLIDES ** For History Lovers * Experience & Discover The Spanish Enlightenment through Goya. ** For Artists * Explained are Goya's Stylistic Developments, Influences & Techniques. "Goya was a man of his time, however he didn't follow the guidelines of many other artists of the moment and that is what makes him really interesting. His work is varied, beautiful, complex and intense. Since he died at age 82, Goya lived and worked through many very important changes in Spain's politics and society. Goya was able to blend his thoughts and ideas, doubts and personal experience together with significant historical events. His artworks bare witness to his genius. To add to his greatness, the man suffered illness, deafness, the horrors of war, the hunger of revolution, the adventures of love and the defeat of disappointment in his fellow Spaniards." WHO WAS ANDRÉ LAMBERT WITHIN THE HISTORY OF JÁVEA ARTS? For many of you that have gone around Jávea on my Jávea Walk, we pop into a palace named Casa Lambert, which was preserved as an arts school and community artist exhibition space by the family of the French-Swiss painter, André Lambert. So, who was Lambert and why was he so involved with the cultural life of Jávea? André Lambert Jordán (1884-1967) was a watercolorist, painter, engraver and Swiss-French architect who lived a large part of his life in Javea. 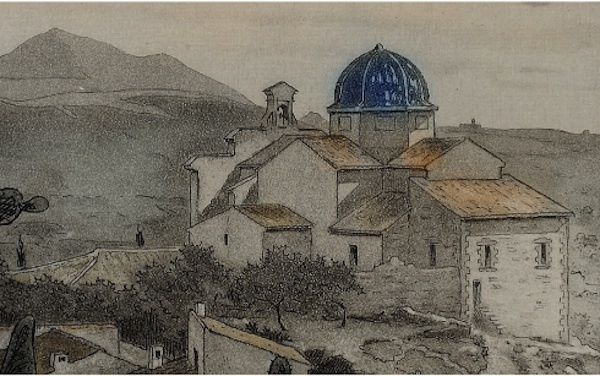 For Lambert, Jávea was a gold mine of interest and he made many art works about the place from historical buildings to the unique landscape. André Lambert was born in Switzerland on March 17, 1884, where he studied architecture at the School of Advanced Technical Studies in Munich. Later he went on to study Fine Arts in the Bavarian capital and it was these studies that ended him in Paris around 1908. André established his first studio in Montparnasse, later moving to the Ile St. Louis. 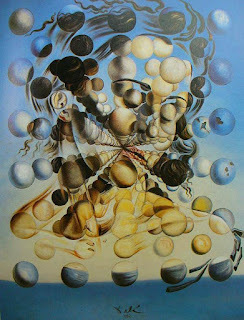 Dali's passion for the sciences, as a way to express mysticism, comes into full vision in this mesmerizing painting - Galatea of the Spheres from 1952. It represents a synthesis of Renaissance art and atomic theory and illustrates the suspension of matter, the spheres themselves representing atomic particles. It was the summer of 1905 when the talented Valencian impressionist painter Joaquín Sorolla brought his family to the Port of Jávea (Playa de la Grava) for a much needed holiday. Inspired by the cliffs of both the Cape of San Antonio and Nou, and the turquoise sparkle of the east facing sea, Sorolla explored some of his greatest impressionist experiments of capturing light and underwater movement. A dedicated artist, Sorolla spent his holiday at work. However, to allow his family the freedom to swim, sun and enjoy their time on holiday too, Sorolla hired a nanny / maid to watch their youngest child Elena, cook, tidy and do their laundry at their 11 cents per day rental accommodation. Unknown to the Sorolla family, this maid had a very jealous military boyfriend from Murcia who was going to turn their happy holiday into a hellish horror! That was a splendid cultural outing to Alicante city with Karla Darocas - teacher of art! We went to the replica of the Spanish Galleon: 'Santisima Trinidad' in Alicante harbour with coffee on the top deck, then on to see the Palm Sunday/ Easter procession in the city centre, off to the Gravina Museum of Fine Arts, then to the Basilica Santa Maria in the very heart of the Santa Maria neighbourhood and last but not least visiting the Alicante Museum of Contempory Art. 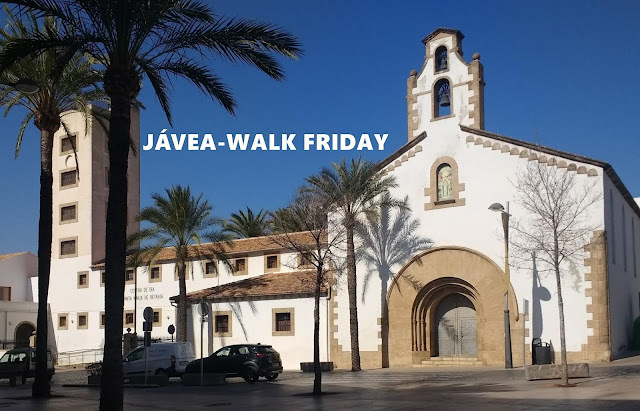 We finished on a romantic and authentic square having a delicious midday meal ( yes, with paella) and after a walk over the famous Rambla of Alicante made it back safely to Benitachell. 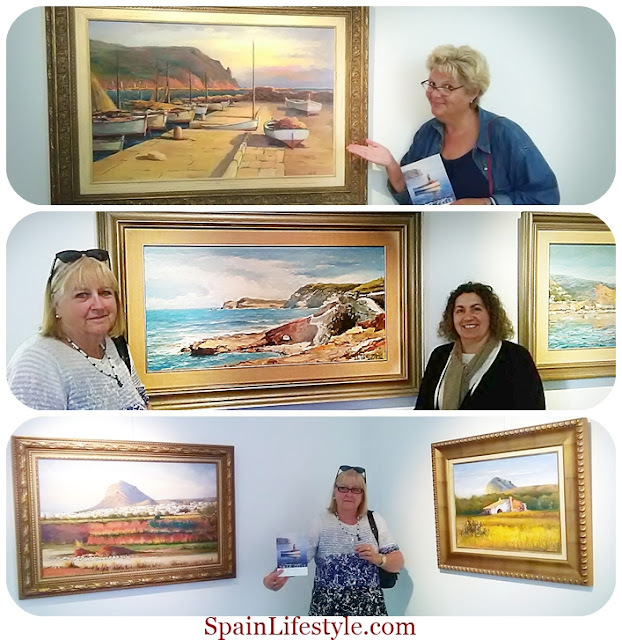 This morning my friends and I were very pleased to visit the retrospective tribute to the Valencian painter - Miguel Sala Coll at the the Lambert Arts Center / House in the old town of Jávea. Excellent gathering of Anglo-Spanish Society members to be enlightened by the brilliant artworks of the Spanish Master artist - Diego Velazquez. Thank you to Keith Hyde for arranging this event and for hiring me to lecture. I am always delighted to share my knowledge and my love of these works of art. There were approximately 60 fine folks at the lecture and a few of my "fans" hung around for this lovely group shot. Dali was the first of the visual artists of his era to seriously question and pictorially document Freudian theories. This Dali presentation will explore Freud’s influence on Dali’s Surreal style with special insights into the concepts "Free Association", “Dream” Painting and of course all of the funny stories and fabulous art that goes with Dali's experiments into Freud's theories of the subconscious! Dali's artwork after 1945 is a historical tour of the scientific events of the 21st century, or at least of those that struck him most. 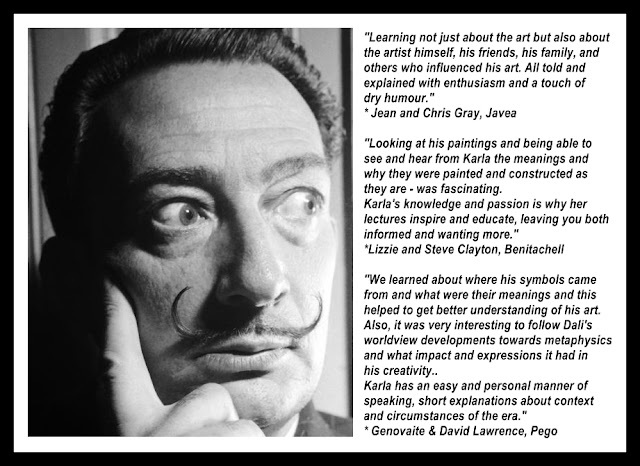 This Dali presentation will explore Dali's influences include the atomic bomb, physics, quantum mechanics, the origins of life, natural law, hermeticism, monasticism, evolution, mathematics, geometry, time travel, catastrophe theory and more!